Only two weeks ago we announced the debut of the young Canadian Shawn Barber who, after overcoming the bar at 5.88 made things clear in aiming at the 6 meters. 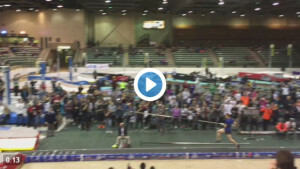 At the National Pole Vault Summit in Reno the polevault world Champion succeeds in his first jump over 6 meters. Just one attempt to overcome the measure and establish the new Canadian record, entering officially in the elite of the specialty and in the restricted club of those who were able to jumper higher than 6 meters. This is an excellent beginning for this specialty which might reserve a lot of challenges in the Olympic season, where Barber will look for his first five circles medal and the WR holer Lavillenie will have to defend his title. While the Frenchman still has to make his debut in 2016, the Canadian has already lightened up the challenge.